In 1942 Cy Bell, the owner of Bell Features, borrowed $75,000 from the Industrial Development Bank and spent $50,000 on a used offset lithography printing press from the Cleveland Plain Dealer. 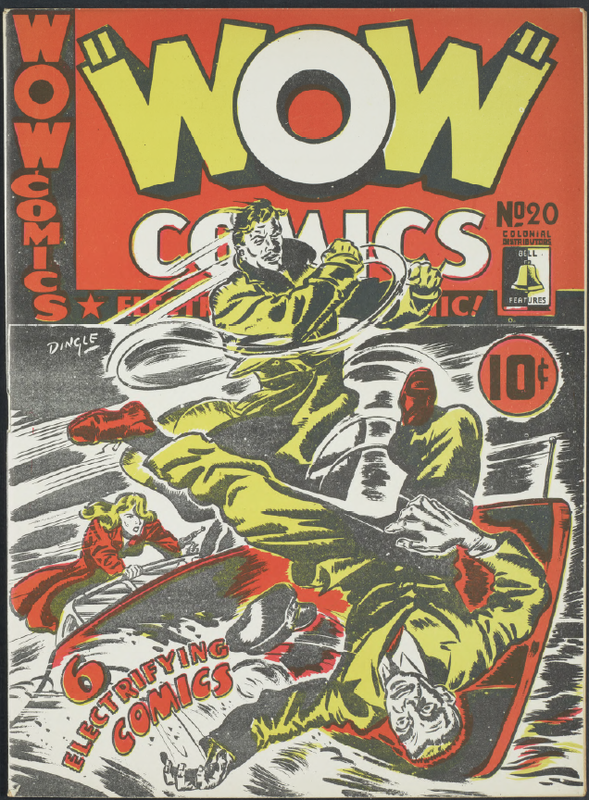 In Bell’s first print run of Wow Comics, issue No.1 sold 52,000 copies and before the war ended, a total of 20,000,000 were distributed. 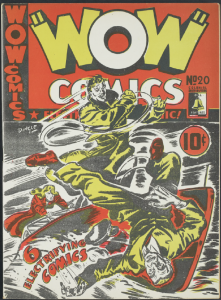 Wow Comics issue No.20 was printed on newsprint stock using offset photolithography and two-tone color printing (Hirsh). Often, comic studies focus on visual illustrations and the meaning they produce through textual and visual elements. The visual content act as entry points for the reader to understand the deeper social, cultural and historical complexities of the comic. To read Wow Comics issue No.20 and experience it solely as a visual expression of ideas would be to ignore the deeper meaning we can draw from its physical properties. David Pantalony, museum curator and historian, asserts that the physical histories of an artifact act to enrich and deepen how we understand that artifact (52). The following paper will delve into Wow Comics’ physical qualities, paper and printing processes, and their lesser known social and cultural histories. Marshal McLuhan’s famous argument “the medium is the message” will build upon Pantalony’s ideas by showing how the physical elements of the comic, its medium, not only enrich our understanding but create meaning (1). Finally, Ian Hague’s insights on how touch plays a key role in experiencing comic books as a physical medium will be useful for exploring how Wow Comics as a physical artifact connotes different meaning than its digital counterpart. What happens when we explore the physical histories of Wow Comics issue No.20? Let’s find out. Before we begin our exploration of Wow Comics’ lithographic history, an illustration of Pantalony’s methodologies will serve to clarify our discussion. In Pantalony’s work, Biography of an Artifact: The Theratron Junior and Canada’s Atomic Age, he argues that museums frequently fail to explain their artifacts rich social, cultural and historical complexities (52). Pantalony exemplified his argument by exploring the physical artifact called Theratron Junior, a green radiotherapy device that lives on display at the Canada Science and Technology Museum in Ottawa. In his pursuit for new complexity, he uncovered that the Theratron Juniors green paint reflected the Canadian governments intention to entice commercial and aesthetic sensibilities of prospective foreign buyers (61). The green paint, an element of its medium, challenged a traditional narrative that the Theratron Junior was a single purpose medical attention device. In comic studies, visual illustration dominates the traditional narrative that meaning is produced solely through illustration. But those visual illustrations did not appear on the comics’ pages by chance, they have a complicated history. From first hand accounts of Cy Bell we know Bell Features’ offset printing press came with unexpected difficulties. Fig.2. Frank, Booth. Brigdens Limited (1893-1912), Bay St., w. side, between Wellington & King Sts W.; INTERIOR, wood engraving shop. Photograph, 1900. Toronto Reference Library Baldwin Collection. Public Domain. Bell explains: “hiring men to run it was another matter….lithography has always been a very tight-lipped business” (Hirsh). Bell’s insights allow us to peer inside the window of Canada’s lithographic history. In 1870 lithography was first established as a trade on the east coast of Canada (Davis 154). As lithography techniques progressed into the late 19th and early 20th centuries a new form of printing came to prominence: photolithography. 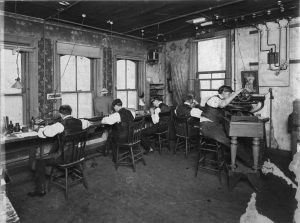 Photolithography’s invention caused a disruption in the economic and social fabric of Canadian labour. With its adoption into Canada’s graphic arts industry in the early 20th century a cultural tension was born between early pressmen, lithographers and photo engravers. The tension arose from new skill sets that were required to operate offset lithography and photoengraving machines. The pressmen’s union wanted to learn the new skill sets to establish a dominant role over the lithographers and photoengravers (Davis 145). The pressmen sought support from the photoengravers but were denied in large part because the photoengravers union was far less established than the Lithographers of North America or the International Printing Pressmen and Assistants Union (David 146). Bell’s comments and the historical tensions between pressmen, lithographers and photoengravers illuminate the deep social, cultural and economic complexities of Canada’s graphics arts industry. Now when we observe the comic’s dark ink pressed onto the thin, beige pages our understanding of how those images were produced is altered. They are not just creative fictions of one individuals mind but rather were born from the struggle between professional unions to maintain economic dominance in a shifting landscape. Through this research we produce new meaning from the comic’s medium that enriches our understanding and illuminates a narrative that has been, for the most part, hidden inside the pages of Wow Comics. Wow comics was produced on newsprint, a form of cheap paper used primarily by the newspaper industry. According to Marshal McLuhan, the medium (TV, radio, books, comics, etc) is more relevant in conveying meaning than the content of that medium (2). McLuhan gives the example that form and function are often separated (5). He states, individuals ask what a “painting is about” but not “what a house or a dress is about” (5). What he means is by asking what a “painting is about” we acknowledge both form, literal paint on canvas, and function, artistic expression. For Wow Comics, we need to ask how the comics form, a photolithographic paper product, creates meaning in relationship to its function, artistic expression. For that answer, we turn to the history of newsprint. Fig.3. n.d. Canada’s Northern timber lands provide the millions of tons of paper used yearly by the Canadian newspaper industry. 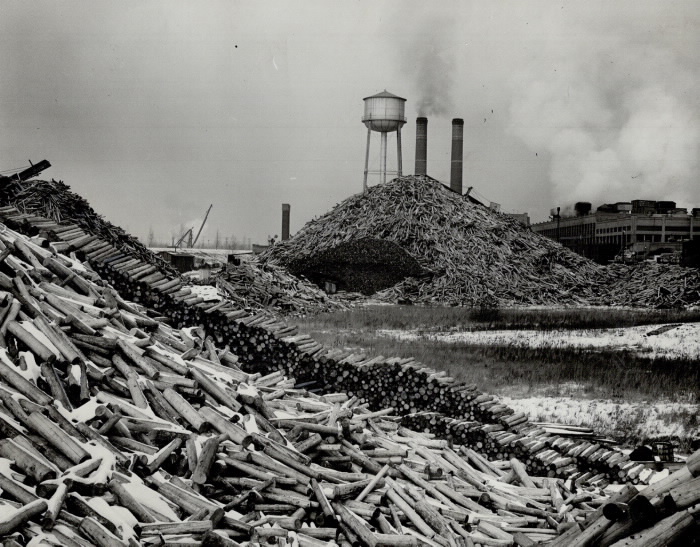 The Star gets a large quantity of its supply from the Thorold pulp mills, where mountains of potential reading matter are piled. Around 350 tons of paper are used by The Star Weekly alone, every week in the year. Photograph, 1941. From the Toronto Star Photo Archives. Toronto Reference Library Baldwin Collection. Public Domain. Newsprint was invented in 1844 by Charles Fenerty, a native of Nova Scotia (Burger 32). During the period before Fenerty’s discovery, rags were the main material used to create paper. In the 1840’s Europe sanctioned rag exportation and Canada’s demand for a new source of paper arose (Burger 31). Fenerty discovered that wood pulp could be ground and turned into a paper product (Burger 33). His discovery was revolutionary because it allowed Canada to begin exporting one of its most abundant resources: wood (Burger 33). The newspapers took advantage of the new, cheap source of paper at a scale which was previously not available (Kuhlberg). McLuhan notes that the “message” of a medium can be understood by “the change of scale or pace or pattern that it introduces into human affairs” (1). He gives an example of how the railway altered the way in which humans lived and worked (1). By parallel, the newspaper industry was able to produce and distribute a much larger volume of content to a vastly larger audience. This shift changed our relationship to paper from one of value and preservation to volume and impermanence. By that very extension we find ourselves back at Wow Comics. The physical grainy and fragile pages of Wow Comics issue No.20 connotes its own message: it was not meant to be preserved. The origins of newsprint as the physical medium of newspaper industries also tells us Canadians’ relationship to newsprint paper was ephemeral, meant to be consumed and discarded each day. The physical medium not only provides an opportunity to enrich and complicate the physical history of the artifact but it also produces meaning through its form, the physical paper it was produced on. By flipping the pages of Wow Comics, the reader experiences the comics medium through touch. Ian Hague, a cultural studies scholar, argues that to fully appreciate the message a comic book conveys we must go beyond the visual (99). He stresses “comics are not images without material substance, they are physical objects that we interact with in physical ways” (98). Hague’s stress on the comic’s physicality as a form of communication extends the work of McLuhan. Hague goes on to specify, expounding that physical touch is a key component of how the message of a comic is delivered. At the most fundamental level by holding the book we are reminded of its physical presence (99). By flipping the pages of Wow Comics we are reminded of its most basic form, paper. This experience in turn creates a connection between our hand and mind which promotes inquiry into an entry point (history of paper) that can be explored. In his article Hague uses Art Spiegelman’s’ In the Shadow of No Towers as an example of how physical form and touch create meaning (101). He notes “it is a large board book printed on fairly hard cardboard pages rather than soft paper. Producing the work in this fashion makes a powerful statement because the hardness here serves to suggest permanence and significance” (101). By the same logic, Wow Comics’ paper medium as cheap and historically ephemeral not only conveys impermanence but highlights the insignificance of its content. An object that is not meant to be preserved would not hold meaning which is valuable to society. But when we change the medium from physical to digital, that changes. Fig.4. Tony Carlucci. Video of Wow Comics, No. 20, Bell Features Publishing. Canadian Whites Comic Book Collection, 1941-1946. RULA Archives and Special Collections, Ryerson University, Toronto, Canada. When we cannot experience the physical object through touch we hinder our ability to understand, explore and create meaning through the social, cultural and historical complexities of the object. My experience with Wow Comics from the beginning has been 90% digital. I have experienced the artifact by clicking a mouse and tapping arrow keys. Did I lose out on an enriched and complicated understanding of the physical artifacts medium? My answer is no, but its complicated. By nature of my profession, I studied the object in question. I was forced to be intentional and dig (Pantalony), understand the medium (McLuhan), and experience the object (Hague). But for the average person that intention may not be there. The digital object without a relationship to the physical flattens rather than enriches. By flatten I mean it acts as a passive agent ready to be accessed. By contrast, the physical object is an active agent always present in our hands,demanding connection between us and its physical existence. Hague’s view is not quite as polarized and I intend to complicate my own argument here. On one side Hague notes that when an artifact is digitized it loses unique qualities such as texture and smell, experiences that have yet to be imitated in the digital space (104). Conversely, he acknowledges that digital comics’ use of sound is far beyond physical comics (105). Hague takes a neutral position. Wow Comics as a digital artifact may flatten the experience but it also allows the reader to easily access those rich social, cultural and historical complexities. Without the internet, my knowledge of the physical artifact may have been vastly limited in its scope. If the physical objectivity of the artifact creates connections which promote inquiry then the digital artifact allows that inquiry to bloom into knowledge. Both the digital Wow Comic and the physical comic together create an enriched experience. A world without any physical artifacts points to a whole new meaning that we will have to explore later. The stories behind each of the comic’s physical properties create rich contextual meaning and convey a message of their own. A Canadian invention, newsprint as a cheap medium specific to the newspaper industry connoted impermanence and devalue. 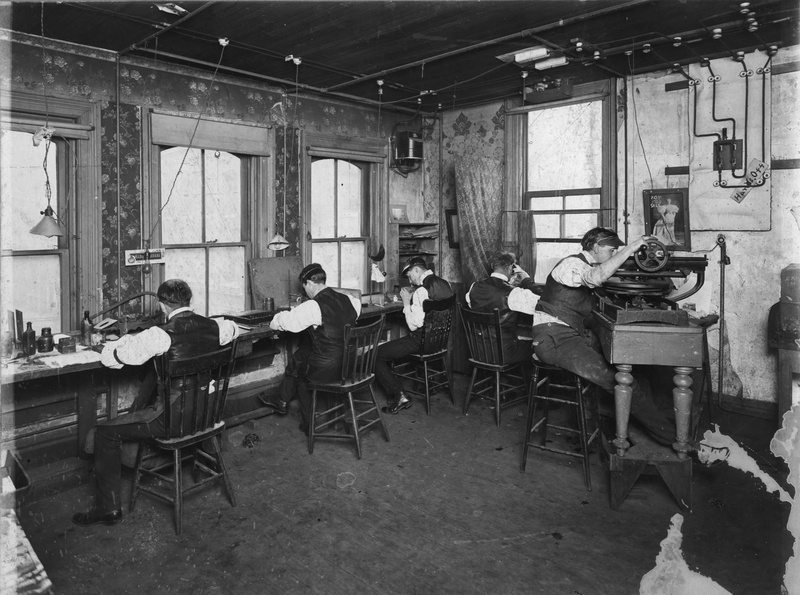 We also learned that new photolithography techniques created discord among Canadian pressmen, lithographers and photoengravers. As a result, Cy Bell, the founder of Bell Features, had trouble finding lithographers to physically print his comics (Hirsh). Pantalony made the argument that the physical properties of an artifact matter and so did Marshal McLuhan. For McLuhan, the whole medium, the comics pages,lithography, etc, conveys a message that is separate from the content. Hague built off McLuhan by arguing that the physical experience of a comic is equally important as the visual. Our experience of the physical comic is important because we gain a deep connection to the object, understanding what the medium is conveying and how that medium is a site for rich social, cultural and historical complexities. What happens when we flatten those complexities through the digital? We no longer actively engage but rather passively consume. But that last statement is complicated because the digital allows easy access for our inquiries to bloom into knowledge. The future holds any number of possibilities for Wow Comics and the future of the genre but we must remember, the physical existence of our artifacts is critical in understanding why they matter. Adrian, Dingle. Cover, Wow Comics. No.20, Digital, Bell Features Publishing, Canadian Whites Comic Book Collection, 1941-1946. Library and Archives Canada, Rare Book Collection. http://data2.collectionscanada.gc.ca/e/e447/e011166682.pdf. Davis, Angela E. Art and Work: A Social History of Labour in the Canadian Graphic Arts Industry to the 1940s. McGill-Queen’s University Press, 1995. Scholars Portal Books, http://books1.scholarsportal.info.ezproxy.lib.ryerson.ca/viewdoc.html?id=34183. Frank, Booth. Brigdens Limited (1893-1912), Bay St., w. side, between Wellington & King Sts W.; INTERIOR, wood engraving shop. Photograph, 1900. Toronto Reference Library Baldwin Collection. Public Domain. Hirsh, Michael, et al. The Great Canadian Comic Books. Peter Martin Associates, 1971. McLuhan, Marshall. “The Medium is the Message”. Understanding Media: The Extensions of Man. Sphere Books, ch.1, pp. 1-18, 1967. N.d. Canada’s Northern timber lands provide the millions of tons of paper used yearly by the Canadian newspaper industry. The Star gets a large quantity of its supply from the Thorold pulp mills, where mountains of potential reading matter are piled. Around 350 tons of paper are used by The Star Weekly alone, every week in the year. Photograph, 1941. From the Toronto Star Photo Archives. Toronto Reference Library Baldwin Collection. Public Domain. Pantalony, David. “Biography of an Artifact: The Theratron Junior and Canada’s Atomic Age” Scientia Canadensis, vol. 34, no. 1, 2011, pp. 51 -63. Wow Comics, No. 20, Bell Features Publishing. Canadian Whites Comic Book Collection, 1941-1946. RULA Archives and Special Collections, Ryerson University, Toronto, Canada. Wow Comics, No.20, Bell Features Publishing. Canadian Whites Comic Book Collection, 1941-1946. Library and Archives Canada, Rare Book Collection. http://data2.collectionscanada.gc.ca/e/e447/e011166682.pdf.